As someone born and bred in sun-drenched Southern California, Chicago has always held a certain appeal. It may seem strange to some, but when fall rolls around and you have nothing to show for it, an unbroken forecast of high 70’s and sunny weather stretching well into December, the idea of having to bundle up becomes appealing. Plus there’s Chicago itself—the architecture, the blues and jazz clubs, the history, the food, the Bean—that is its own perennial draw. So when Flaunt received an invitation to go see what Marriott Hotels has been cooking up in the revitalizing South Loop neighborhood, I eagerly volunteered. The name “Marriott” might not evoke the most romantic associations. They’ve traditionally been a bread-and-butter brand, offering road-weary businessman or middle-class families on a much needed summer vacation a place to stay without breaking the bank. Marriotts might not be flashy or hip, but you can count on them to be reliably comfortable and clean, with friendly service that makes you feel at home. But things are changing in the hotel industry. The rise of Airbnb and boutique hotels has demonstrated a new demand for hotels that offer not consistency, but variety—these places are popular because they provide a sense of being embedded in the local culture, with all the quirks and excitement that entails. Marriott has taken note. 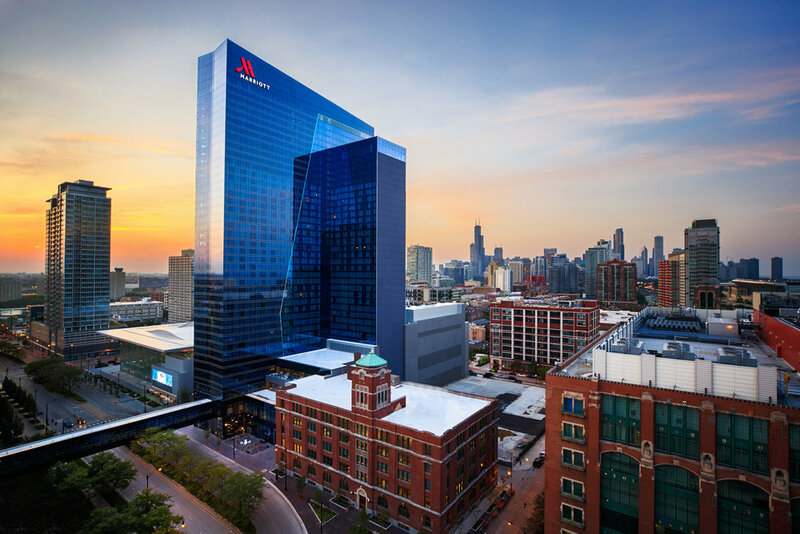 The first thing I noticed when I walked into their new Marriott Marquis location in Chicago's South Loop neighborhood was the art—prominently placed sleekly modern pieces created by local artists. The second was my room, which, along with offering sweeping views of lake Michigan, looks like the cool minimalist apartment you wish you had. The third was the food, which takes inspiration from Chicago to offer bespoke dishes and drinks that offer a taste of the place. I was eager to get out into the city. Fed and refreshed, I stepped out into the brisk (ok, astonishingly cold—especially for someone unaccustomed to the art of layering) Chicago air to head downtown. I was determined to see as much as I could during my short stay, and for this the hotel’s proximity to the L’s red and green lines was essential. There were deep dish pizzas, “Italian Beefs”, and Chicago hot dogs to eat, the Architecture Biennial to attend, and what is perhaps the best art museum in America to revisit. But, at the same time, there was an intriguing roster of activities drawing me back to the Marriott, including a “Marriott Rewards Moments Master Class" with DJ Terry Hunter, one of many such programs offered as "experiences" to loyal guests. Plus, the hotel—warm, amenity rich, beautifully designed—and my dreamy room-with-a-view turned leaving into a test of willpower. That just meant more time on the L, which holds it’s own charm—heading out to Wrigleyville or Lincoln Park or Boystown way up north in the morning, back to the South Loop for that day’s activity—including meeting the CEO of Marriott, checking out the illustriously attended ribbon-cutting, and the aforementioned DJ class—and then back out into the city again. I walked the always-lovely Millennium Park, ate like a king, sampled more than my fair share of dive bars, and caught a couple shows. But tonight was the main event, and despite all I wanted to see in Chicago, I couldn't miss it—the Marriott Marquis Chicago Grand Opening Party highlighted by a live performance by Jennifer Hudson. Before the event hundreds of eager fans gathered in the lobby and reveled in the hotel bar. This was something I hadn't seen before—suddenly Marriott seemed to be the place to be in town. It was done to the nines—interactive installation art, drones pouring drinks, DJ sets, an assortment of tasty snacks. After Hudson's powerful performance, and with my time in town coming to an end, I faced a dilemma: get a decent night of sleep before my flight in the morning, or try to see more. Naturally, I chose the latter, and went out to check Wicker Park and Bucktown off my list. One thing I've learned in my travels is that the hangover and fatigue will wear off, but missed moments can't be recaptured. Luckily Marriott offered me a way to have it both ways, so even though I closed the bar down at 4am, and, after saying my goodbyes to newly minted friendships, I wasn't back in my room until nearly five, I was able to sneak in a few hours of restorative sleep in a cozy bed before my flight. Au revoir, Chicago.